Asteroid belts are made up of many asteroids which can be mined for raw ore. These can be found in missions, through exploration sites, and right-clicking in space. Some systems will have more than others, but all systems have belts. In this picture you can see where to find each ore in empire space. Belts in low security systems tend to be less visited than high security ones, and thus have more ore in them. Right-click in space, and you might see a few in the context menu. Warping to the belt will place you at the warp-in point for the asteroid belt. Asteroids are typically distributed in a rough semi-circle about 24 km from the warp-in point. These belts are there for everyone to grind on, and in highly visited systems they are frequently mined to oblivion. Asteroids that have been mined down to nothing are re-spawned during downtime a few times per week. Those asteroids that have not been destroyed, will instead grow a little, until they reach a maximum size. Asteroids are not distributed uniformly. Asteroids distribution differs according to the sovereignty of the system and the security status. This in turn has an effect on how easily the refined minerals may be extracted within each race's territory, particularly Mexallon, Isogen and Nocxium. 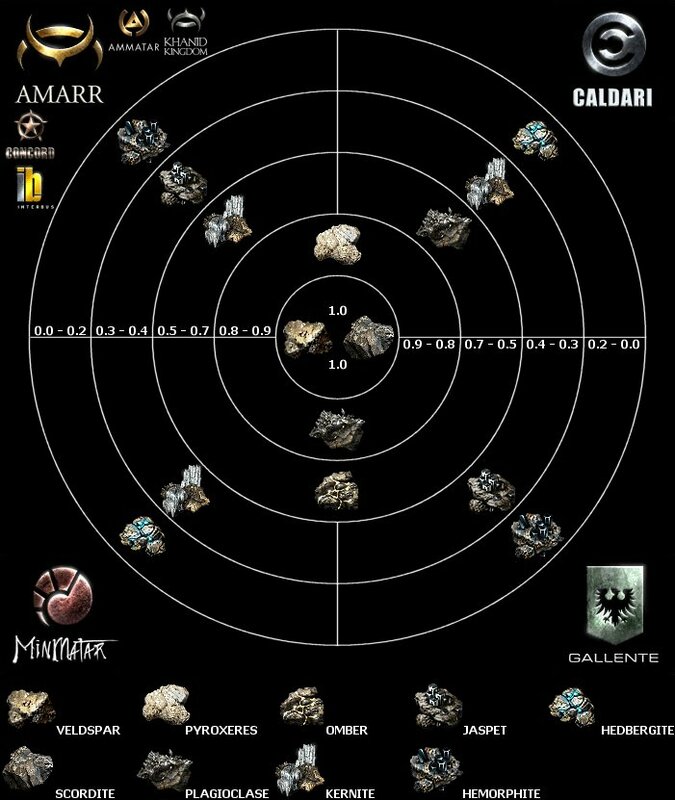 Caldari cannot mine ores containing Isogen in high-security space but have a ready supply of ores containing Mexallon and Nocxium. Ores in high-security Gallente and Minmatar space contain Mexallon and Isogen but not Nocxium. High-security Amarr space contains all three minerals but Mexallon may be in short supply. To mine minerals that are in short supply in high-security space, it is necessary to mine in low-security space or mine in high-security space in another empire. This shortage creates opportunities for trade. This does not include belts found by exploration, which may have ores and minerals that otherwise cannot be found in that system or even in that race's territory at all. Many times when a pilot accepts a mission from an agent, an asteroid belt is included in the mission space. These can be mined, and are only available to the pilot doing the mission, or someone with the skills to scan it down. Often these belts have better ore than what is available in the public belts for that system security. Asteroid belts can also be found through exploration, and may contain even more valuable ore than in both public, and mission belts comparing the system security. This page was last modified on 27 September 2012, at 02:28.